Home » Events » Exclusive Rachel Litfin Interview! Written by: JediJondee46 on April 4, 2018. Rachel Litfin. Photo by the author. I had the chance to talk with author Rachel Litfin at her booth for Long Beach Comic Expo. When I came across her, she was dressed in what she called her “traveling author garb”, which was a beautiful teal dress with a brocade corset. 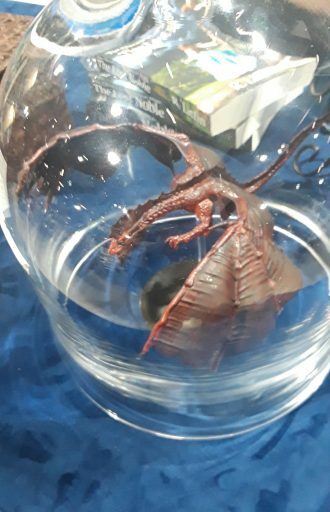 Her booth itself featured the artwork for the book cover, and on her table sat a glass case with a tiny dragon. She was talking exuberantly with many fans. Dragon encased in glass. Photo by the author. Rachel Litfin’s novel was intriguing to me as a premise, and her pitch was engaging to me as well as to other attendees who stopped by her table in Artist’s Alley. 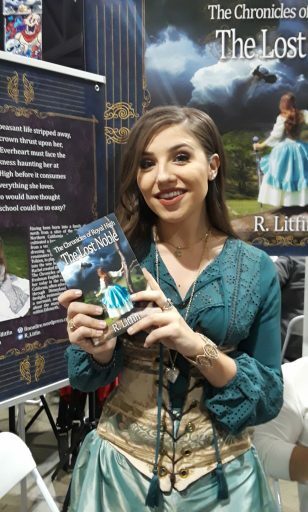 I hope everyone has a chance to check out The Chronicles of Royal High: The Lost Noble, and, if you see Rachel Litfin at a con such as the Silicon Valley Comic Con this weekend, definitely stop by and meet her.